"The Walking Dead" Season 7 has had a rocky road thus far, and the Feb. 12 midseason premiere title is following suit. According to AMC, the title of Season 7, Episode 9 is "Rock in the Road," with this very brief synopsis: "Rick is introduced to a new community." Will that community be the Kingdom, which we've already seen, or perhaps the new group teased in the AMC photo above? Both? Maybe Tara's Oceanside as well? We know a Join Us To Fight Negan pitch will be made to Hilltop leader Gregory, but Hilltop is not a new community to anyone at this point. Whatever happens, it will be supersized again, beyond the usual hour timeframe. Episode 9 is scheduled to be 1 hour and 13 minutes, with "Talking Dead" getting a later start at 10:13 p.m. to accommodate. In the meantime, AMC is doing its usual "Walking Dead" marathon, which always starts on Super Bowl weekend (counterprogramming!) and picks up the next weekend as a lead-in for the launch of the second half of the season. Check out the AMC schedule for the rundown. There are 16 episodes to "The Walking Dead" Season 7, so the big finale should be on Sunday, April 2. 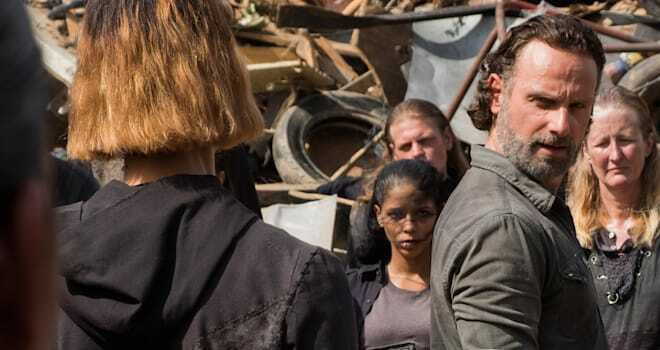 The stars have already been plugging that episode, but Andrew Lincoln (Rick Grimes) said the back eight episodes are "magnificent" with a very different tone than the first half. "The Walking Dead" returns Sunday, Feb. 12 at 9 p.m. on AMC. Did 'The Walking Dead' Just Clear Up That Plane Question From Season 7?